Location: Stevenston, North Ayrshire, Scotland. Built: c. 1191, rebuilt after 1488. Ownership / Access: North Ayrshire Council. Open to the public but with limited access. Notes: Kerelaw Castle is a castle ruin situated on the coast of North Ayrshire, Scotland in the town of Stevenston. This castle, variously named Kerelaw, Kerila or even Turnlaw, is said by Timothy Pont to have been held by the Lockharts from Richard de Morville, Constable of Scotland, as far back as 1191, after Stephen Lockhart or Loccard obtained a grant of land in Ayrshire. This land would be named Stevenstoune (later Stevenston) after himself, and their manor-place of the barony of Stevenston, named Kerelaw. The castle and barony were eventually passed on to the Campbells of Loudoun and later to the Cunninghames (or Cunninghams/Cuninghames) of Kilmaurs. It was in the Cunninghame's possession in 1488 that the castle was sacked and burned by the 2nd Lord Montgomerie, during the well documented and long-term feud between these two prominent Ayrshire families. 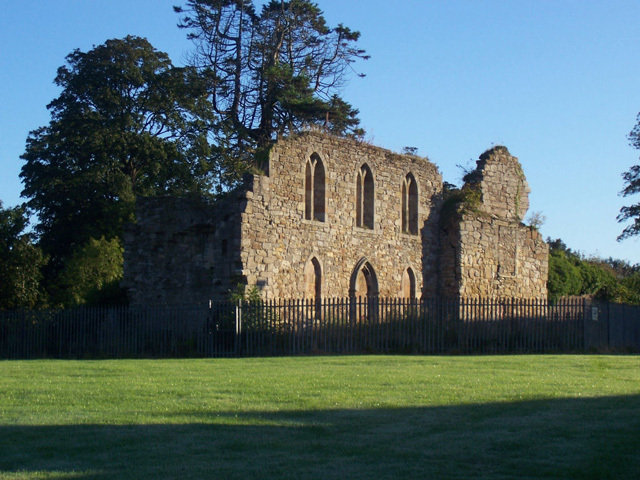 The Cunninghames, led by the Earl of Glencairn burned Eglinton Castle to the ground in revenge in 1528. Kerelaw was rebuilt sometime after 1488 and is reported to have contained a number of carved coats of arms of the Scottish nobility, taken from Kilwinning Abbey, Nine fishermen from Saltcoats were granted leases in 1545 in return for carrying the Earl's furniture to Finlayston on the Clyde every spring from the Creek of Saltcoats and bringing it back again in the autumn when the family returned to Kerelaw for the winter months. A half barrel of herrings was also to be furnished yearly to the Earl.